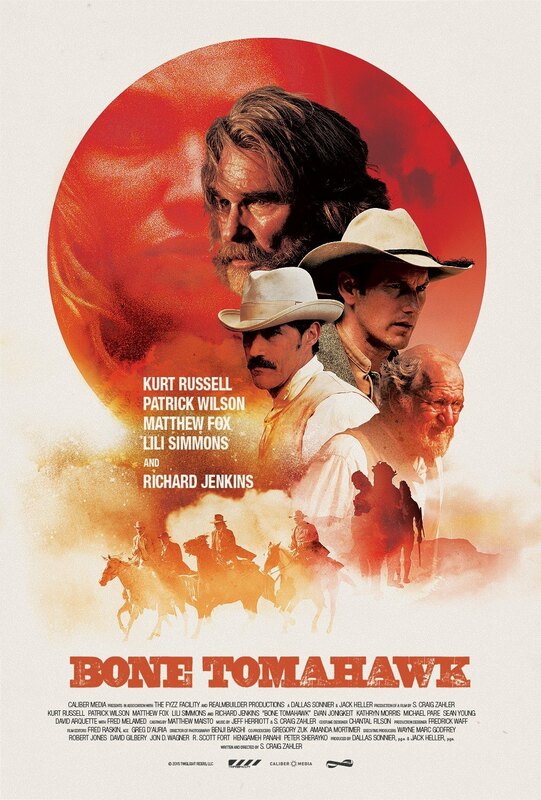 Bone Tomahawk, the film, is everything it's gloriously seventies-inspired poster would have you believe it is. From the opening frame we are privy to just how violent this ordeal is prone to get. The slitting of a throat is an excruciating act that is made even moreso when the person holding the knife is unsure of what they're doing. In the opening moments of Bone Tomahawk though it is clear that there are only assured hands present. Buddy (Sid Haig) and Purvis (David Arquette) slice the throats of unsuspecting travellers for no other reason than to rob them blind and move on to the next town. The violence is swift and the visuals are exceedingly bloody which seems to be just the way first time feature director S. Craig Zahler likes it. That this is actually Zahler's directorial debut is somewhat extraordinary as this largely feels like a movie made by an old pro or someone who knows the ropes of pacing and organic character development like the back of their hand. Even more impressive, Zahler single-handedly wrote the screenplay that more or less takes every trope from any Western you've ever seen and somehow incorporates them into an always tense, never yielding story that mirrors The Searchers meets any number of those Italian cannibal exploitation films. The inspirations are clear, the characters more or less archetypes, and the story is not particularly revelatory but somehow-more by craft that innovation-Zahler is able to bring his elements together and form a sum that is greater than it's well-worn parts. Zahler is somehow able to make cinema's oldest genre feel fresh again and that is the film's biggest accomplishment. To this effect, the film is more self-referential than it would be had it been made at another time, but this endearing, self-deprecating quality paired with excellent dialogue throughout and Kurt Russell playing a sheriff is ironically what lends the film it's stylish facade. 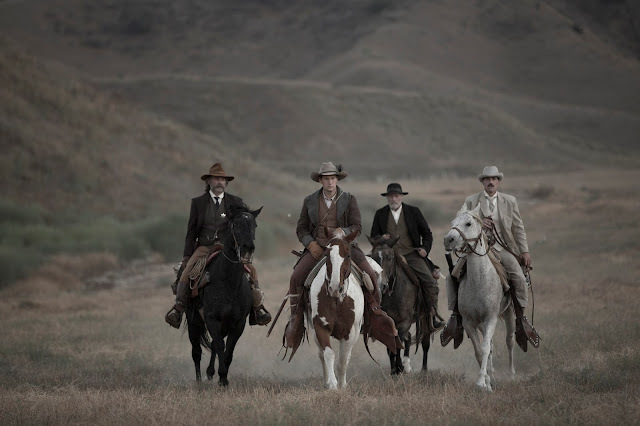 Bone Tomahawk is as much a film to be admired as it is to be devoured, but that the promise behind these ideas and this style actually deliver is strangely rewarding in a way I didn't see coming. 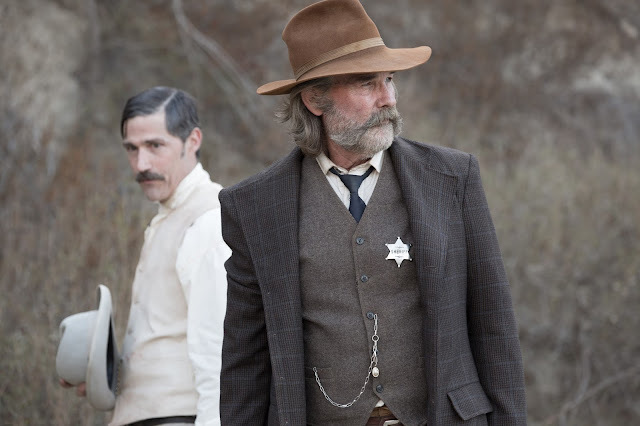 John Brooder (Matthew Fox) and Sheriff Hunt (Kurt Russell) set out to find the kidnapped Mrs. O'Dwyer. After Buddy and Purvis come across what are assumed to be cannibalistic cave dwellers and (kind of) accidentally mess up what looks to be some kind of sacred burial ground Buddy is shot in the throat with an arrow and Purvis narrowly escapes. Cut to eleven days later and we're introduced to the small town of Bright Hope where Russell's Franklin Hunt is Sheriff and Purvis has made his way to the town's local bar. After being spotted by the elderly back-up Deputy, Chicory (Richard Jenkis), Purvis is detained and questioned by Sheriff Hunt and Chicory at the same bar where the town's morally vague sharp-shooter, John Brooder (Matthew Fox), also happens to be hanging his hat for the night. Seeing that he is up to no good, Purvis attempts to make a run for it before the Sheriff shoots him in the foot. Taking him back to the jail, but recognizing his need for medical care the Sheriff sends Brooder to fetch Mrs. Samantha O'Dwyer (Lili Simmons) who is the town doctor. O'Dwyer's husband, Arthur (Patrick Wilson), is a cowboy in the most traditional sense, but is currently laid up and giving his leg time to heal after an accident on the job. While Mrs. O'Dwyer is away and tending to Purvis the rest of the town falls asleep only to wake up to find the jail emptied and a local stable boy killed via an arrow to the head. No doubt the result of Purvis' dealings with the cave dwellers he, Mrs. O'Dwyer and Hunt's actual Deputy, Nick (Evan Jonigkeit), have disappeared with the general assumption being they were kidnapped. As a result, our four protagonists (Russell, Wilson, Fox, Jenkins) then set out to save Arthur's wife and the Deputy unaware of the many horrors that await them. With it's strong sense of what it is, to the point it can comfortably throw in light comedic moments in an otherwise horrific scenario, Bone Tomahawk thrives on being comfortable in it's own skin. There is nothing about the film that makes it feel as if it's trying to fit into a pre-defined genre or that it's even concerned with hitting the necessary beats of a Western and yet it does, but without making it seem forced. Zahler does a fine job of streamlining his story into a simple task (save the girl) while highlighting it with multiple personalities. While the film has plenty of strengths it would be a lie to say that the cast was not one of them. Each actor, working with vastly different characters, succeeds in their own right. As the larger hero of the piece, Russell was born to play this type of role. One can almost feel Zahler grinning with glee behind the camera as he no doubt grew up loving Russell in his onslaught of eighties action films. To have Russell in the role here is both a bit of stunt casting in that the actor has played this kind of role before, but to such an extent that it's been a long time since he last inhabited such a character and thus the opportunity is ripe to prove why he's so good with such characters. Russell is immediately recognized as this kind of "stand-up guy" and that is exactly what Zahler needed Sheriff Hunt to exude giving the casting of Russell even more justification. Both Fox and Wilson are more than capable in their roles of two middle-aged men looking at the world from two very different perspectives and yet both make their case for why such life choices are respectable for each. Fox especially seems to be having a good time playing up the gray area of Brooder's moral code while Zahler's no frills dialogue only stands to enhance each performance. The MVP of the film though, is Richard Jenkins. As Deputy Chicory, Jenkins delivers a truly affecting performance in what is essentially the stereotypical salty old eccentric man who doesn't know when to shut his mouth. Jenkins gives Chicory an enormous amount of layers as each of his scenes reveal something new about the character making us all the more invested in his outcome. are on a rescue mission in Bone Tomahawk. Zahler could have easily delivered something much more rote for a first effort or even a safer homage to this genre he clearly cares for, but instead the writer/director combines two complimentary genres allowing us to feast on an idea so off the wall that it just so happens to make perfect sense. While Bone Tomahawk is likely not the first Western to so actively use cannibals as part of it's narrative it is undoubtedly the goriest Western about cannibals you've ever seen; if not the goriest film you've seen in some time. For the first hour and fifteen minutes or so we're subject to what we may have expected from such a film with such a glorious poster, if only highlighted by the skill at which it's been put together. As the film reaches it's third act though, things begin to take a turn for the insane. Leading to what is one of the most gruesome acts I've ever seen put on screen, the encounter with the labeled antagonists of this world is worth the price of admission alone. I wanted so badly to look away, but couldn't out of pure curiosity for just how much Zahler was willing to show and just how far these cannibal cave dwellers, referred to as Troglodytes, were willing to go. Part of me wishes I hadn't allowed my eyes to find out the answer to that question and yet it is the brutality of the climax that will forever ingrain this film in my memory. That's not to say the film is only memorable for these few scenes at the end that are meant to simply deliver a payoff to everything Zahler has been meticulously pacing himself towards the entire film, but they certainly take the film to the next level. Beyond this, cinematographer Benji Bakshi captures the gorgeous open landscapes to great effect, the character designs for the cannibals are genuinely terrifying, and the ensemble cast work well together to deliver what is largely a character-driven piece only accentuated with deftly written dialogue and imagery that, again, will haunt you.